"Peter Neill is one of life’s nice people. And yet the soft-speaking Irishman works in one of the most volatile businesses imaginable, where egos and excess converge with often-explosive results. The music business is not known for its manners, and yet here we meet a man who is charm itself. Could this be the secret to getting iconic shots of bands on the run? CPN Editor David Corfield finds out..."
Check out the entire article (with 19 sample images) at the Canon Professional Network. 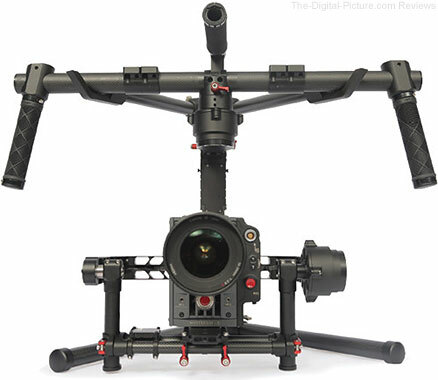 B&H has the DJI Ronin 3-Axis Brushless Gimbal Stabilizer in stock with free expedited shipping. If you haven't seen what tihs stabilizer can do, then check out the awesome video below and the behind-the-scenes look at its creation. 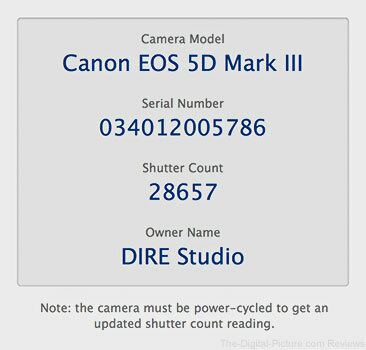 ShutterCount displays the number of shutter actuations (the shutter count) of your Canon EOS digital camera. The shutter count is read directly from a USB-connected camera, and thus provides accurate numbers that are not attainable with simple EXIF-based methods. With ShutterCount you can easily check whether a newly purchased camera is really new, or check how heavily used a pre-owned item is. And you can save a trip to a Canon Service Center by doing the reading for yourself. The app provides unlimited readings for an unlimited number of cameras, so you can freely track actual camera usage. Even if you work for a rental house or just lend a camera to a friend. ShutterCount only displays the shutter count for still photos - video clips recorded are not included in the number. For a separate mirror movement reading (that includes videos) you should consult an authorized Canon Service Center. History logging allows you to track camera usage. Logs are stored in CSV format that can be imported into Apple's Numbers or Microsoft Excel for further processing. History logging is not available on Windows. Note: for the best compatibility with your camera it is recommended to upgrade the camera's firmware to the latest available version. 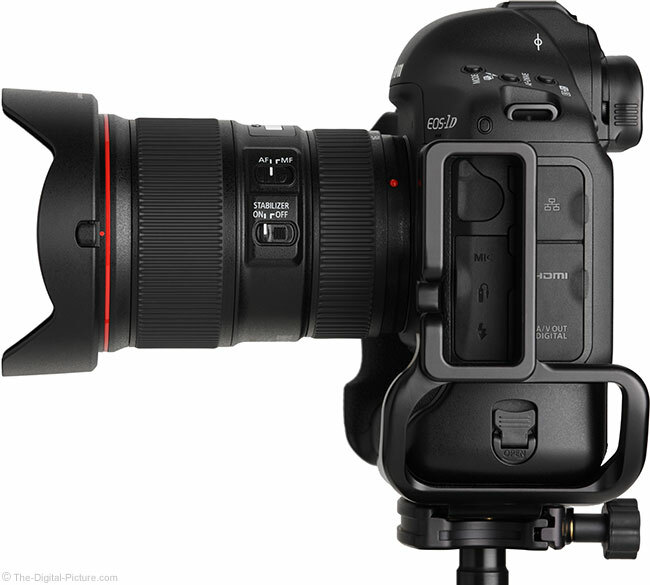 WiFi on the EOS 6D and 70D must be turned off as it blocks the USB port when turned on! ShutterCount is certified to work with all of the cameras listed above, using their latest firmware revision. Please quit all applications that might connect to your camera (e.g. Canon EOS Utility, Capture One, Adobe Photoshop Lightroom) before launching ShutterCount. Questions? Problems? Check out the ShutterCount FAQ or contact our support! Note: I just purchased the ShutterCount app for Windows and it worked perfectly on my Windows 7 laptop. It was able to tell me the shutter count on my EOS 7D and 5D Mark III as well as each camera's serial number. What is the Difference between the Image Stabilization Systems found in STM Lenses and L Lenses? With the Canon EF 16-35mm f/4L IS USM Lens and Canon EF-S 10-18mm f/4.5-5.6 IS STM Lens reviews recently happening back to back for me, a question that I had in my mind for quite some time became highlighted. That question was: "What is the difference between the image stabilization systems found in Canon's EF-S STM and other budget-priced lenses and those found in higher grade lenses including those in the L series? Perhaps the question was most-driven by the "feel" of a large price differential between these image stabilization systems. Determining exactly how much IS adds to the price tag is not easy since there are not many Canon lens focal lengths or focal length ranges available in the same max aperture with image stabilization being an optional feature. Three examples are the 70-200 f/4, 70-200 f/2.8 and 100mm f/2.8 macro lenses. In all three of these instances, the IS version is considerably more expensive, with the $450-$1,050 difference being more than the price of most STM lenses. In all fairness, the IS version of the three just-mentioned lens siblings is a considerably-newer model and newer lenses typically have better technology and are always more expensive. But, it still "feels" like the IS system in the higher grade lenses is more expensive than the IS system in the lower-priced STM (and similar) lenses. This of course drives my wonder about what the difference between IS systems is. The compensation optics lens barrel is suspended by 3 springs that hold it in place in the center. This makes it possible to eliminate the compensation optics retaining mechanism in this IS unit. The drive actuator for the compensation optics lens barrel is constructed using the same permanent magnets and coils used in existing IS units. Making use of the technology that has been garnered in existing L-series IS lenses, such as a stepping motor for the compensation optics barrel lock mechanism, this lens is able to achieve both high-performance image stabilization and compactness of design. The moving parts in the compensation optics barrel have been improved from sliding friction to rolling friction by way of combining rolling balls and V-grooves in an ultra-minimum-friction structure. This design improves IS performance while reducing power consumption. IS Mechanism Parallel-moving corrective optics (Single element.) IS unit is based on the one used in the EF-S 18-55mm f/3.5-5.6 IS II. Parallel-moving corrective optics (Group of 4 elements.) IS unit is newly designed especially for this lens. Centering/Lock when IS is Off When the IS is Off, image stabilization optics are locked in place with a spring suspension mechanism rather than a center lock mechanism. When the IS is Off, the image-stabilizing lens group is centered and locked in position. While not completely revealing, the above information does show some of the IS design differences between these lens classes. Permalink: What is the Difference between the Image Stabilization Systems found in STM Lenses and L Lenses? Ottawa, ON – August 27, 2014 – Corel’s Photo Editing group introduces Corel PaintShop Pro X7 and Corel PaintShop Pro X7 Ultimate, the latest editions of its professional quality photo editing and design software. Photographers and designers can achieve their best work faster with the new content-aware Magic Fill, extensive user interface improvements and brushes that offer a 30% performance boost. Giving photo pros and enthusiasts an image editing application that’s affordable and easy to use, Corel PaintShop Pro X7 delivers the impressive feature set and power expected from a professional caliber software package. New! Make it vanish with Magic Fill: The new Magic Fill provides content-aware editing that works with your favorite selection tools. Erase an unwanted element in your photo and seamlessly replace it with content that matches the background area—even if it’s textured or varied. Improved! 30% faster brush performance: Enjoy more responsive brushes, including the Paint Brush, Airbrush and photo retouching brushes that are up to 30% faster. Plus, 64-bit power means you can achieve results quickly. New! Text and Shape Cutter tools: Instantly create a unique photo object by using text or shapes to clip underlying photos or imagery. Paste or drag the resulting photo object to any image to build a collage. More than professional-quality photo editing, PaintShop Pro X7 is also a powerful design program for any visual project. New! Materials Palette featuring Color Harmonies: Find the color, texture or pattern you want more quickly. Easily sample colors with a Dropper tool and create your own custom palettes to keep track of your favorite color combinations. New in the Materials Properties, Color Harmonies help you create a custom palette for your creative projects. Select one of the preset color harmony settings to see color suggestions and choose colors that look great together. PaintShop Pro X7 enables you to learn as you go with built-in training tools, including the award-winning Learning Center and video tutorials. With RAW editing, an enhanced layer workflow, HDR and more, PaintShop Pro X7 is the photo-editing and digital design software that’s ideal for any project. For users looking for a total photo editing, design and RAW workflow solution, PaintShop Pro X7 is the ideal complement to Corel AfterShot Pro 2, the industry's fastest RAW converter and photo management software. Corel also today announced Corel Photo Video Suite X7, delivering PaintShop Pro X7 and VideoStudio Pro X7 for photo and video editing in one complete package. Corel PaintShop Pro X7 and Corel PaintShop Pro X7 Ultimate are available now in English, German, French, Dutch, Italian, Spanish, Russian, Chinese Traditional and Japanese. 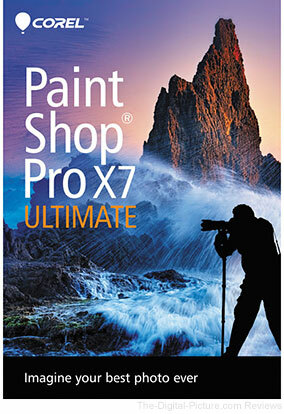 B&H has Corel PaintShop Pro X7 available for preorder. United Kingdom, Republic of Ireland, 28th August 2014 – Canon today announces details of its presence at photokina 2014, unveiling its most interactive environment ever at the world’s largest photography and imaging show. Designed around helping photographers immerse themselves in the latest technologies, Canon’s programme at the show will offer visitors a digital imaging experience that highlights its industry leading range of products and services. Canon’s stand at photokina 2014 will be dedicated to the journey of capturing a moment or memory. Within an open, free-roam environment, visitors will be invited to undertake shooting challenges, with experts on-hand to guide them along the way. The experiential event will go far beyond simple touch and try demonstrations, and instead provide the opportunity to truly experience the Canon range. The stand will also feature live presentation sessions with Canon’s world famous photography ambassadors. Presenters will include landscape and travel photographer David Noton, photojournalist and documentary filmmaker Ulla Lohmann, and action shooter Richard Walch, with each providing first-hand accounts of how Canon products help them to realise their individual visions. Furthermore, Canon Explorer Jörg Kyas will be taking on interactive challenges set by visitors – providing a unique way for enthusiasts to learn about new styles or techniques. In addition, Canon’s custom-designed platform for managing and sharing a world of images, irista, will be demonstrated, highlighting Canon’s dedication to furthering the capabilities of digital services. Visitors will also be able to browse Canon equipment and piece together their own ‘virtual kitbag’ using touchscreen tables placed around the stand. To allow attendees the opportunity to retain their experience, Canon Live Pass RFID cards will be supplied to allow visitors to scan in at key points around the stand in order to create a souvenir site which is tailored to their interest areas, and to which they can refer after the show. Those not attending can keep up to speed via the official Canon Europe YouTube channel, where videos will provide a summary of each day’s events. Alternatively, the action can be followed live on Facebook or on Twitter / #CanonPhotokina. A virtual tour of the Canon experience and other Canon photokina content will be available on the dedicated photokina website. Canon’s stand will be located in Hall 3.2. 8/27/2014 – Photography is easy. Good photography is hard. To aid aspiring and experienced photographers in honing their art and craft, we launched a weekly blog column, “Ask the Pros,” that solicits insights from top pro photographers. “Ask the Pros” features luminaries from all fields of professional photography. They include David Burnett (named one of the "100 Most Important People in Photography"), Pulitzer-winning photojournalists Al Diaz, Deanne Fitzmaurice, and Vince Laforet, photojournalist, member of VII Photo, and a National Geographic contributor Ed Kashi, street photographer Alex Coghe, architectural and design photographers Dallas Dahms and Mike Kelley, digital innovator and eclectic shooter Falcon, photography publisher Jose Atunes, documentary and humanitarian photographers Ziv Koren, Melissa Lyttle and Ami Vitale, and commercial photographer Nathan Pask. The Canon Camera Museum has added the EF-M 55-200mm f/4.5-6.3 IS STM Technical Report to its archives. 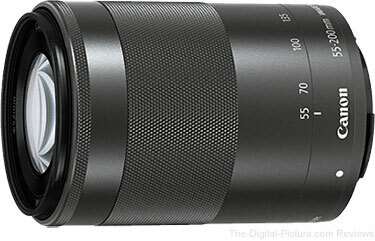 Amazon UK carries the Canon EF-M 55-200mm f/4.5-6.3 IS STM Lens. August 27, 2014 - DxO Labs announces the immediate availability of DxO Optics Pro v9.5.2 for Mac and Windows, the image processing software of reference for all serious photographers. This upgrade allows DxO Optics Pro 9 to offer support for the Nikon D810 (Elite Edition only) and to surpass the milestone of 20,000 available DxO Optics Modules. Thanks to its exclusive DxO Smart Lighting feature, DxO Optics Pro optimizes the overall contrast of an image by intelligently adapting to its contents. Details in the four different light ranges, once thought to be unrecoverable, are revealed, even when the information was missing in the original RAW files. This makes it the perfect tool to use with the Nikon D810, which offers a great depth of color and very large dynamic range, resulting in subtle gradations of tone in both highlights and shadows. DxO Optics Pro v9.5.2 also adds 894 new camera/lens combinations to its library of DxO Optics Modules, thus providing support for Konica Minolta, Nikon, Olympus, Sigma, Sony, Tamron, Tokina, and Zeiss lenses for numerous Nikon, Panasonic, and Sony cameras. DxO Optics Pro has surpassed the milestone of 20,000 DxO Optics Modules. Developed in the laboratory through an exclusive calibration process, DxO Optics Modules contain all the information about the characteristics of each camera and lens. This database, unique in all the world, allows DxO Optics Pro to automatically correct distortion, vignetting, chromatic aberrations, and lens softness with an unrivaled level of quality. With five laboratories throughout Europe, DxO Labs has greater capacity for calibrating and measuring cameras and lenses, thus ensuring an even higher production rate of DxO Optics Modules. B&H carries DXO Optics Pro 9. Update: Coincidentally enough, B&H just uploaded a video called Intro to DXO Optics Pro 9 Photo-Editing Software. Photo hobbyists can now use Eyefi Cloud on IFTTT for automating how and where photos are published and shared. MOUNTAIN VIEW, Calif., August 26, 2014 — Eyefi, the global leader in connecting digital cameras across devices and to the Internet, today announced an official integration with IFTTT (short for If This Then That). Photo hobbyists now have a fast and simple way to take photos with their digital camera, wirelessly transfer and automatically sync them to Eyefi Cloud, and trigger customized and automated actions in IFTTT that simplify their workflow. Photo hobbyists can also now connect their cameras to over 125 Channels to quickly and easily trigger actions for how and where their photos are published and shared, how they are stored and how they integrate with other applications such as Facebook, Twitter, Instagram and Evernote. "As a photographer, I want to spend time behind the lens taking pictures, not in the office mired in the details of photo management," said Sergey Sus, recently named a Top Socially Influential Photographer. "Eyefi Cloud integration with IFTTT automates many of the manual tasks involved with organizing and posting photos to multiple social networks so I can share instantly and organize them the way I want without being burdened with multiple steps." IFTTT enables anyone to create powerful connections with one simple statement: if this then that. Now Eyefi Cloud members can access the Eyefi Channel on IFTTT and create custom "Eyefi Recipes" that integrate with more than 125 other Channels such as Facebook, Instagram, Flickr and Dropbox. Custom recipes help hobbyists save time by automating tasks that would otherwise be manual. For example, an Eyefi Recipe can be created so that if a photo in Eyefi Cloud is tagged "social," then it will automatically be posted to Twitter, Facebook or other networks, rather than having to individually post each photo. This gives photographers of all skill levels the ability to share pictures the moment they are captured, across the major social networks. In addition Eyefi Recipes can be created to send favorite pictures from social networks to a personal photo library. For example, if a photo on Instagram is tagged #myfavorite then it will automatically be uploaded to Eyefi Cloud. "We are constantly improving digital camera connectivity, and our integration with IFTTT supports that," said Sam Hui, Vice President Products at Eyefi. "Eyefi Cloud integration with IFTTT eliminates manual tasks, enabling digital cameras to directly connect to the Internet and social networking applications with ease." Earlier this year, Eyefi announced Eyefi Cloud, a private photo-centric cloud service that makes newly captured photos instantly available on a smartphone, tablet, PC or smart TV. Eyefi Cloud is designed for photo enthusiasts who require the superior image quality provided by digital cameras but are frustrated with the time-consuming processes required to enjoy those photos on multiple devices. Eyefi Cloud, along with the Eyefi Mobi wireless SD card and Eyefi Mobi apps, allows every picture taken to be instantly organized and accessible, anytime anywhere—to enjoy, curate and share securely and privately. B&H carries Eyefi wireless memory cards. London, UK, August 27, 2014 – Canon today announces its activity programme at Visa pour l’Image 2014, the annual festival of photojournalism held in Perpignan, France. Championing the festival for 25 years, Canon is a long-running supporter of the illustrious event and will showcase its leading range of products and services at the show, whilst offering expertise to the 3,000 accredited professional photojournalists registered to attend. The Canon experience zone at the festival will display Canon’s vast range of professional products – from image capture through to printing – with the opportunity for photographers to experience the latest products for themselves. Accredited photographers can also visit the CPS depot where there will be the opportunity to have their equipment checked, cleaned and have small repairs undertaken, all for free. Canon continues to work with an impressive line-up of leading industry professionals, focussing on promoting the best in photojournalism. As part of the seminar line-up, Canon Ambassador Ziv Koren will be hosting a technical workshop, which will provide attendees with an overview of using the EOS 5D Mark III and the EOS-1D X in low-light. Seminars will take place in the Palais des Congrès, with the full programme to be announced on the Canon Professional Network site (http://cpn.canon-europe.com) in the coming weeks. The work of other Canon Ambassadors will be showcased throughout the festival, including Canon Explorer Sarah Caron who will be displaying iconic images from her forthcoming book Movida Massala, which celebrates Pakistan’s diverse and rapidly evolving fashion industry. In partnership with Canon, experts and photojournalists from Getty Images will also be hosting a series of roundtables, showcasing the award-winning photojournalism the company is renowned for, as well as providing insight, expertise and advisory into how aspiring photojournalists can stand out in today’s competitive landscape. Evening screenings of exhibitors’ and photographers’ work will take place daily throughout the festival at the Campo Santo and Place de la République. Canon has again sponsored the Female Photojournalist Award 2014, which will be presented at Visa pour l’Image. Supported by ELLE magazine, this year’s award is granted by Canon to Viviane Dalles, for her project, Teenage mothers in North of France. Dalles will receive a grant at the award ceremony on 6th September 2014, to support her portfolio of work. All entrants have been judged on both previous works and plans for future projects. In addition, the 2013 winner, Mary Calvert, will be exhibiting her work on the War Within at the festival. In honour of the 25th anniversary of the esteemed Ian Parry scholarship, an exhibition of iconic images from the entrants will be showcased at the festival, all of which will be printed on Canon’s imagePROGRAF large format printer. Canon will also provide the 2014 winner with an EOS 5D Mark III to aid them with their chosen assignment, alongside the main grant provided to allow them to shoot their project. B&H is now shipping the Nikon D810 DSLR Filmmaker's Kit with free expedited shipping. Eric Stoner has written an informative article for the Canon Digital Learning Center with helpful tips for capturing better cycling photos. As a cycling enthusiast, I also really enjoy the opportunity to photograph a pro cycling event. Since 1985, there has been a pro cycling race in my hometown of Philadelphia every June. It’s sort of a yearly ritual for me to photograph the event and this year was no exception. Preparation is a major key to great sports photography and it certainly pays to do your homework before an event like this. Learning the road course BEFORE the race is the key to knowing where the best shots may occur. Knowing where the sun will be at certain locations on the course will prove valuable, so driving the race route will allow you to pre-visualize your shots..."
Read the entire article at the Canon Digital Learning Center. In the Experiences section, B&H interviews professional photographers in various photographic genres. One of my personal favorites was an interview with Gregory Heisler on portrait photography, but many other well-known photographers are included covering architectural to wildlife photography and everything in between. The Virtual section allows the user to see how various aspects of a lens can make or break a shot. See how scenes change as the focal length, aperture or tilt is varied. You can also see a demonstration of the helpfulness of image stabilization and the benefits of using macro lenses. The Lenses section allows you to scroll through Canon's vast number of lenses and see a short summary of each lens. The product line is organized into three parts – Prime, Special & Zoom lenses. The Why Canon section is simply a link to a previously published B&H Explora article called "Everything You Need to Know about Canon Lenses.". The article does a good job explaining the design elements of a lens and the significance of various things such as coatings, fluorite glass, aspheric lenses and diffractive optics. And as you might have guessed, the Glossary provides a resource for explaining all those obscure sounding words related to photography. Abbe Number, anyone? Overall, the The Canon Lens Experience page is an enjoyable way to learn about Canon lenses. Take a look – I think you'll agree! And for a more in-depth look at specific lenses, you might want to check out this handy resource. Capturing good butterfly pictures can be challenging. Perhaps the biggest two challenges to butterfly photography are constant, significant subject motion and tattered wings. Butterflies are seldom still and often have a mild fear of humans. Add a little wind to their lightweight, wing-dominated bodies and even a stationary butterfly has motion. Tattered wings are often best overcome by finding a new subject. It is hard to get a great butterfly picture without a near perfect wings and butterfly wings seem to deteriorate rapidly in their short lives. Even good quality subjects can require significant post processing to make wing repairs. Raise your own subjects and these two challenges are erased. Well, erased for a short period of time at least. The kids have taken such an interest in monarch butterflies that we now have milkweed (the monarch caterpillar's food source) growing amongst a section of our house landscape. I'm not sure what others think about these "weeds" in our landscape, but ... the girls collected some monarch eggs this summer and raised them indoors, out of the reach of predators. Last week, the monarch metamorphosis moved from the chrysalis stage to the butterfly stage. A bit of warning is given before the butterflies hatch – the color of the chrysalis turns from bright green to transparent, showing the dark butterfly tightly packaged inside. But, it takes a watchful eye to see the chrysalis open as this event occurs very quickly. Once open, the monarch pumps its wings up rather quickly and then appears to remain the same – and motionless – for a long enough period of time to capture many photos. I was ready for this particular hatching. I had the milkweed leaf holding the chrysalis in a Delta Grip-It Clamp that was sitting on the kitchen island. A moderate distance behind the main subject was a cardboard box with a sheet of printer paper taped onto it. A Canon Macro Ring Lite MR-14EX II Flash was mounted to a Canon EF 100mm f/2.8 L IS USM Macro Lens and the lens was mounted to a Canon EOS 5D Mark III DSLR. A Canon Speedlite 600EX-RT Flash was in its shoe stand and configured as an optical remote slave to the ring flash. 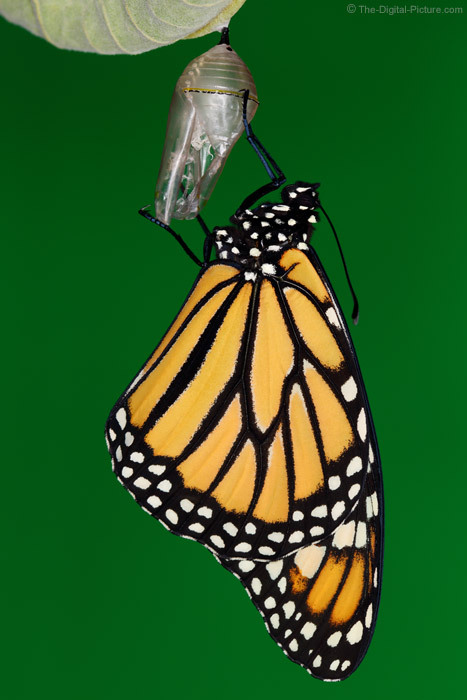 The perfect-condition butterfly hatched and hung motionless from its chrysalis while I went into action. The lighting I used for the butterfly image series I captured on this day, and a great technique for lighting in general, was separated by layer. The ring lite was providing the main subject layer lighting and the slave 600EX-RT took care of the background light with brightness levels individually controlled from the ring lite. With a white background and a set of Rogue Flash Gels, I was able to create a large variety of background colors for the images, but this particular shot's background was simply a green notebook. A variation I incorporated into some images, to create a less-even background color, was to use a coarsely crinkled sheet of aluminum foil as a reflector beside the printer paper. After nearly two hours of posing, the butterfly became active and was released outdoors. After the forth butterfly hatched in as many days, I had enough willpower to just observe the process without a camera.